Francis: "Romero is a man of God"
Pope Francis has spoken explicitly for the first time about his desire to see the beatification of Archbishop Oscar A. Romero of El Salvador, saying that, “For me, Romero is a man of God” and stating that there are no more doctrinal problems standing in the way of the martyred prelate’s beatification. “It is important to do it quickly,” the Pontiff added. Francis made his remarks aboard the papal plane flying back from his trip to Korea on Monday, August 18, 2014. The Pope was asked by a reporter about the status of the beatification cause and the Pontiff responded that theologians still need to clarify whether Romero was killed because of his faith. Francis even suggested a way for theologians to resolve what has been the stickiest issue in the process. “What I would like is that they clarify when there's a martyrdom for hatred of the faith — for confessing the faith — as well as for doing the work for the other that Jesus commands,” the Pontiff was quoted as saying. Under Francis’ proposed solution, death for the cause of Christian justice—sometimes called «odium iustitiae»—would be established as an alternative formula to prove martyrdom in relation to the traditional test (called «odium fidei» or “hatred of the faith”). It is currently a subsidiary test, but the analysis can often get bogged down in theological debates. Francis’ remarks today represent the first time the Pope publicly expressed his support for Romero’s beatification. 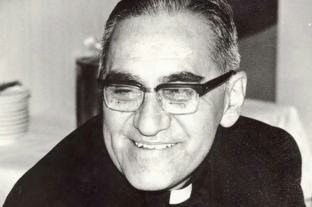 He is said to have been even more enthusiastic in private, and commentators have observed that Romero’s message seems to fit the themes of Francis’ papacy, especially the emphasis on the poor from a son of the Latin American church. Francis explained that the process had been “blocked out of prudence” by Vatican officials but should be now allowed to advance. The Pope said that the investigation must take its course, and suggested the matter was in the hands of God. “But the process must go ahead, and God must give his sign. If he wants to do so, he will,” the Pontiff said. He also hinted that the progress in the process depends also on human hands: “now the postulators have to move, because there are no longer impediments,” he said. Saint John Paul II discussed Archbishop Romero in seven different public speeches/audiences. The most famous of these was a 1983 mass in San Salvador where he called Romero a “zealous pastor, whom love of God and service of brethren drove to surrender his life in a violent manner.” Pope Benedict XVI spoke about Romero during three different public events, including an in-flight press conference after a 2007 trip to Brazil, during which he said, “That Romero as a person merits beatification, I have no doubt ... Archbishop Romero was certainly an important witness of the faith, a man of great Christian virtue who worked for peace and against the dictatorship, and was assassinated while celebrating Mass. Consequently, his death was truly 'credible', a witness of faith.” For his part, Pope Francis, while not making public statements before this press conference, had heldhigh profile meetings about Romero, including with two presidents of El Salvador and with a delegation of Salvadoran bishops. Q. At what stage is the process for the cause of Archbishop Romero. And what would you like to come out of this process? A. The process was blocked in the Congregation for the Doctrine of the Faith “ for prudence”, it was said. Now it is unblocked and it is in the Congregation for Saints and follows the normal path of a process. It depends on how the postulators move, it’s very important to move in haste. What I would like is to have clarified when there is martyrdom in ‘odium fidei’ (out of hate for the faith), whether it is for confessing the credo or for performing the works that Jesus commands us to do for our neighbor. This is a work of theologians that is being studied. Because behind him (Romero), there is Rutillio Grande and there are others. There are other that were also killed but are not at the same height as Romero. This has to be distinguished theologically. For me, Romero is a man of God. He was a man of God but there has to be the process, and the Lord will have to give his sign (of approval). But if He wishes, He will do so! The postulators must move now because there are no impediments. An article in La Pagina today reports that church leaders and politicians including President Salvador Sanchez Ceren and Foreign Minister Hugo Martinez were expressing hope and jubilation at the news. Tim, I think it's interesting what part of Francis' message people choose to emphasize. The very first report I saw yesterday focused on the Pope saying, "TO ME, he's a man of God" but we should let the process run its course--which sounded as though Francis wanted to stay hands off. Salvadoran officials seem to be homing in Francis' comment that there are no doctrinal impediments. That's not really news, as it was reported last year that such an all-clear was given by the Vatican's doctrinal agency under Pope Benedict. The Salvadorans say: well, it's the first time we get the news from the Pope himself, and that's true, though arguably he's not the most direct source. What I am focusing on the day after is Francis' comment that "the postulators need to move." I think it's a not so subtle message from Francis that he expects the officials handling the matter to expedite it.